Daniel: The Colored Lens focuses on Speculative Fiction: specifically stories that cause us to see the world a bit differently after reading. Your Monster Hunter series of books are definitely different. Your writing style seems rooted in a desire to create characters who act in ways that, were they in a book more representative of “high culture” commonly found in modern Western canon, would result in a very short book. Larry: I have never been accused of high culture. I write to entertain people rather than win awards. I’ve been called a pulp throwback, but I’m pulp and proud. Daniel: Your plots are gritty and, despite the presence of magic and monsters, grounded with a heavy dose of realism. Larry: I am a huge fan of horror movies, however as a gun nut and self-defense instructor, when I watched them I had to check my brain at the door. Most monster or slasher movies would be over during the opening credits if the protagonists had a clue. My original goal with MHI was to write about my kind of people stuck into those big B movie situations. Daniel: Maybe there just wouldn’t be much of a story if the group didn’t split up and get picked off by the evil monsters one by one, yet you seem to pull it off with ease. Larry: In the movies when the monster shows up people scream, run, and get eaten. In real life, my kind of people would simply get out their shotgun and blast the thing. Problem solved. So I needed to come up with a way to have smart, tough, tactically minded people running up against the mystical forces of evil on a regular basis. So I made them contractors who killed monsters for profit. One reason I think readers have liked MHI so much is because the characters treat it like a job. They do this stuff for a living, so they don’t screw around. Daniel: Sometimes I find myself screaming at a character in a book… maybe I take them too seriously… but really, I want to know why sometimes it seems like, for no other reason that plot development, why don’t characters just do things that make sense? Larry: They always say “write what you know”, but sadly most writers don’t know jack about weapons or tactics, which is why you end up with urban fantasy action sequences that read as flat out absurd to anybody with a clue. Daniel: Some literary snobs look down on your style of writing as “pulp” – junk food of the literary world. And in once sense, it is, not that there is anything wrong with that. We need twinkies and cheeze-puffs as much as we need foie gras and filet mignon. And in that same sense, it’s fantastic. Like a B-movie turned cult classic, people seem to revel in the style and latch on to characters much the same as they would a “high-brow” deeply meaningful work. Larry: There is this idea out there that “serious” authors only write message fiction, which usually turns into some ham-fisted politically-motivated bloated nonsense. Then the literati elite get together and issue each other awards for how brilliant they are. Meanwhile, readers are just sick and tired of getting preached at and just want to be entertained. Meanwhile the number of people who read for entertainment is ever dwindling, but the literati elite just can’t seem to figure out why. When I became one of the finalists for the Campbell Award for best new fantasy/sci-fi writer, I had critics freak out. I had one critic say that if I won the Campbell Award I would “end literature forever”. Though the best negative review I ever received from a snooty literati critic was when somebody pointed out that MHI had Lovecraftian elements, but that Larry Correia was no Lovecraft, but rather more of a modern Robert E. Howard… He meant it as an insult but I took it as a huge compliment. Daniel: Through all of this, you’ve had books rank up into the top 25 on the NYT Best Seller list. To what do you attribute this success? 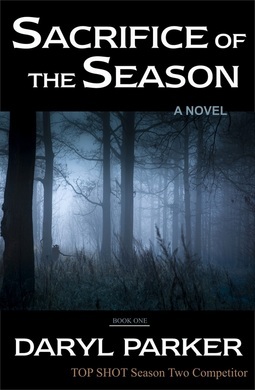 Larry: I want my readers to have fun and be entertained, so I try to write books that do that. When people have fun, they tell their friends. Larry: I do love me some royalty checks. I’m not one of those sensitive artiste types. I like to get paid. When I do a new series it is usually because I’ve got a bunch of stories in my head that I want to share. I love world building and I love research. A new series is just a great way for me to expand out and tell the types of stories that don’t fit in one of my already existing worlds. I’ve got three going on right now, but plans for an additional two and a couple of stand-alones. Daniel: You do a lot of table-top roleplaying in various worlds such as Dungeons and Dragons. Does this experience affect your storytelling? Larry: I am a gamer, and right now my game group is made up of a bunch of novelists. We’ve got Hugo and Nebula nominated writers, an award winning poet, and if I count the dude that is moving to Germany, 3 Campbell finalists. So my game group is pretty dang good at story telling. I don’t know if that has any actual bearing on my writing (other than sucking up my free time) but I am enough of a dork that I still write game journal stuff that is basically glorified fan fiction for fun. Daniel: Your first Grimnoir Chronicles book Hard Magic just came out in mass-market paperback. One can’t help but notice certain similarities between it and your Monster Hunter series: individuals with special abilities being used by the government for their own purposes. Daniel: Do these series share the same universe? Daniel: Give us a brief overview of this new world you’ve created, where, in an alternate history, magic reappears some time in the 1850s. Larry: The Grimnoir Chronicles is a sort of alternative history/epic fantasy series. The timeline diverged from our own in the 1850s when a small section of the populace started displaying magical abilities. As time goes on, a growing percentage of the population becomes magically “active”, until by the 1930s about 1 in 100 has some form of power, and 1 in a 1000 is capable of really screwing with the laws of physics. The first book is Hard Magic, and it takes place in 1932. The presence of magic has altered history quite a bit. As a history nerd this allowed me to really tweak a few things. I looked at how magical super powers would change things like war, art, culture, sports, even organized crime. It was also an excuse for me to read a four foot tall stack of history books. So then I took that world and cloaked it in a sort of hardboiled-noir-action-pulp style. I went for Raymond Chandler writing the X-Men. The main character is an ex-con, war hero, bounty hunting P.I. named Jake Sullivan who gets roped into a case involving the Grimnoir. The Grimnoir are a sort of self-policing secret society that tries to protect people with magic from the world, and to protect the world from people with magic. Their main opponents are the magical Iron Guard of Imperial Japan. This is the only book I’m aware of that features a teleporting magic ninja fight on top of a flaming pirate dirigible. Daniel: Spellbound, book two in your dieselpunk series, continues on where Hard Magic left off, only now the members of the Grimnoir Society are being hunted, and Jake Sullivan once again finds himself in the midst of the adventure. Larry: Spellbound was a ton of fun to write. I’m working on the 3rd book in the series now, Warbound. Larry: We’re both large, gun nut, accountants, but beyond that we’re really not very much alike at all. However, whenever a critic accuses me of creating a Mary Sue, I simply smile, nod, and say that particular Mary Sue has paid my house off. Daniel: We find him at a Monster Hunter convention where, naturally, huge monsters attack and the fate of the world once again hangs in the balance. What other developments can we look forward to seeing in this newest book? Larry: Legion gives me a chance to introduce rival monster hunters from around the world. A leftover from a WWI weapons experiment crawls out of the ground in Dugway which sparks a not-so-friendly competition between the various companies to see who can bag it first. Only the creature is a whole lot more dangerous than anyone suspects. It ties into the overall story of the first few books, plus it gave me an excuse to totally trash Las Vegas. Daniel: Why Las Vegas? Is there only so much action that can take place with Owen et al. in the deep south? Daniel: Can you tell us any details of the much rumored TV deal? Larry: Entertainment One, the same company that did the Walking Dead, optioned the rights to Monster Hunter. Right now they’ve got the rights, but I haven’t heard anything about it actually going into production. Hollywood is a strange place, and though it would be totally awesome to get a TV show, I have no idea if it will actually go into production or not. Daniel: Joss Whedon to direct perhaps? Larry: That would be great. However I’m hoping he takes all of his Avengers money and makes a new Firefly series. Speaking of Joss Whedon, I’ve had a couple hundred emails from fans pointing out some similarities between the endings of MHI and MHV and something that happens in Avengers. Personally I think that was a coincidence, and that it was just something way too awesome not to do, and somebody else probably wrote that into a story long before I thought of it. Daniel: How is it that a Combat Accountant / Author like yourself ends up inside a GI Joe comic book? Larry: I’m a fan of the guy currently writing GI Joe. Chuck Dixon wrote the Punisher and Batman for a long time and I think he’s the best writer in comics (When you watch the new Batman movie this summer, Chuck’s the creator of Bane). I got to know Chuck on the internet and I gave him some gun advice. When he found out I was an accountant right when he had a storyline where GI Joe needed an accountant, Spreadsheet was born. Yes… Codenamed Spreadsheet. So I am officially a GI Joe. 12 year old Larry Correia has now achieved all of his goals in life. (I also married a girl that looks just like the Baroness). Daniel: Recently Apple has been accused of price-fixing. Amazon has long led the charge to discount E-books to prices that publishers say are unsustainable. You’ve partnered with Baen, a champion of DRM-free E-books in a variety of formats and available for almost every platform. It’s obvious that digital publishing has changed the world forever, but what do you see for the future? Larry: The last few years have had so much change that it is hard to predict. People ask me all of the time about self-publishing, because that is how I got my start, but already only a few years later the way I did it is obsolete. 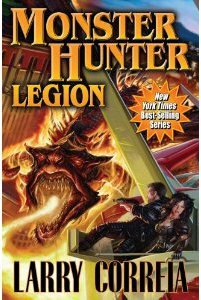 I do believe that Jim Baen got it right a long time ago though. DRM is annoying and stupid. Daniel: Is there a balance where anyone can publish their own novel and yet the concept of digital-rights and copyright protection still exists? Larry: As long as there is any kind of art, there will be pirates. I like to think that most people are honest and if given the chance to pay a reasonable price for something, they will. There are like fifty scumbag pirate sites ripping me off right now, but honestly most of the people who download thousands of free ebooks aren’t going to actually read them. They’re hoarders. Same as the dude with 100,000 illegal song downloads. I work and produce a product, and decent people are going to pay for that product if they want it. Jerks will steal it. Same as anything else. That said, the absolute last thing I want is the government to overreact. I’d much rather be ripped off by pirates than give the government some sort of Orwellian powers over the internet. Daniel: I’d be remiss if I didn’t ask about your stunning success as an initially self-published author. Do you have any advice for budding authors seeking to have their own works published? 1. Practice until you are good enough that people will give you money for your stuff. 2. Find the people who will give you money for your stuff. When the editorial team here at The Colored Lens sat down and started thinking through the myriad of decisions involved in putting together a magazine, I confess I had my doubts and fears. I worried that our theme of shifting perspectives on the world would be either too limiting or too conversely too generic. I worried that we wouldn’t get very many quality submissions. I worried that we wouldn’t find a reader base. I even worried that we might blow up over creative disagreements among the editorial staff. Now, as we debut our first official issue, I find my concerns to have been so far from the reality that I can only laugh. There have been no blow-ups, or even real disagreements. We’ve got the start of a reader base. We’ve had a plethora of great submissions. And we’ve put together an excellent handful of stories that do, indeed, help us see the world just a bit differently than when we started the story. In Margaret Taylor’s “Ravensdaughter’s Tale,” we see the magic that can come from friendships, even in the least expected of ways. Gerri Leen’s, “Cinema Verite” shows us the value of memories, and the cost they can carry. Erin E. Stocks’ “The Bringing Moon” offers a different kind of cost for the things we hope for. Shawn Rubenfeld’s “Martha in the Manuscript” shows us how difficult escaping the past can be. S.J. Hirons’ “You’ve got to Tell Your own Tale” reminds us of how magical a world can be, and how differently it can be interpreted. Elise R. Hopkins’ “The Heroics of Interior Design” reminds us what it’s like to be on the fringes of society. And the first half of Gary Cuba’s novella “Songs of Eridani” introduces us to a world that leaves us questioning what the true dangers are. We’re excited to present the first issue of The Colored Lens, and hope you enjoy reading it as much as we have enjoyed bringing it to you. 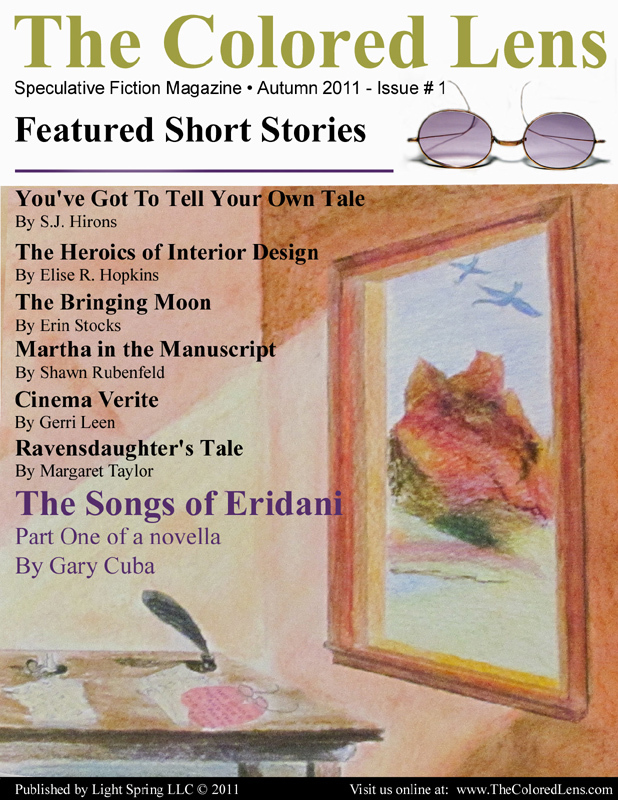 The Colored Lens is a quarterly publication featuring short stories and serialized novellas in genres ranging from fantasy, to science fiction, to slipstream or magical realism. By considering what could be, we gain a better understanding of what is. Through our publication, we hope to help readers see the world just a bit differently than before. The Colored Lens #1 – Autumn 2011 is available for only $0.99 in e-book format for Kindle or Nook. Read a free sample of this issue in your Google Chrome or Safari web browser by clicking here. We are looking for an Art Director to work with the rest of the editorial team to review and develop artwork for the magazine. If you are interested, please send a message to Editors@TheColoredLens.com outlining your background and experience as well as several pieces of your own artwork or a link to an online gallery.